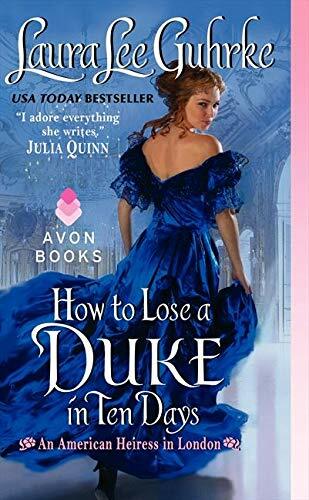 This trend towards cutesy titles tends to set my teeth on edge, but in the case of How to Lose a Duke in Ten Days by Laura Lee Guhrke, the title at least makes sense when you read the story. The heroine has ten days and she most definitely wants to lose the duke. Too bad he's not inclined to get lost. While being the second entry in Guhrke's American Heiress in London series, this story stands alone quite well. Edie Ann Jewell is the heiress in question, in London to snag a husband after her options dry up in New York. She as no desire for a husband but has even less desire to go back to America. She's at a ball when she overhears gossip about the new Duke of Margrave. Stuart is the spare, and while prepared to be the duke, feels no joy for the responsibility now thrust upon him. The coffers are bare, the holdings in disrepair, and his clueless relations expect their healthy allowances to just keep magically appearing. All Stuart wants is to get back to Africa, where he's been living the life of perpetual explorer. Edie hears this and thinks "Oh happy day!" She has the gumption to proposition Stuart. He marries her, he gets to go back to Africa, and she lives the life of independent wife while running the estate. Oh, and she'll deal with his annoying family as well. She gets to stay out of New York, has the protection of being married without all the marital obligation, and he gets to go back to Africa to live out the rest of his days. They shake hands, they agree, life is good. Until it all changes for Stuart and he comes home to England wanting to make Edie his wife in more than name only. A development she is not terribly pleased about. I've seen a lot of glowing reviews for this title, and to be honest, this was a second half book for me. It all starts out in a manner that didn't really quite work for me. Edie, while positively intriguing in the first book of the series, is more like a little girl running scared here. Stuart's motivations for suddenly wanting a "real marriage" didn't always gel for me and on top of this? Edie's got a precocious tween sister who has charmingly rebellious stamped on her forehead. The nice thing about babies in romance novels is they don't talk. Just saying. That said, I will admit the girl grew on me after a while, and eventually she is dispatched off page to allow the Edie/Stuart romance to blossom without her meddling. But over the course of the early chapters things smooth out. Edie's motivations come into stronger focus, and Stuart is your classic Hero In Pursuit, a trope hard to hate on (at least in my opinion). Also Guhrke is one of the best dialogue writers in the business, and this story features all of her trademarks, from the banter to the flirting to the sparring to the tension and chemistry. Edie may be running away for a good portion, but at least you understand why and she has a way of giving as good as she gets when it comes to Stuart. Neither of these two is going down without a fight. I ended up enjoying this story quite a bit, although the epilogue continues to stay lodged in my brain and give me pause. It's happily not a blissfully big with child sappy epilogue, it's more Machiavellian in nature. I'm sure 99% of readers will probably be fine with it. There's some justice that must be mete out, and it is. However it's the outcome of this justice, the plotting behind it, and ultimately the result that made a tiny bit of me recoil inside. If you're a bit more biblical in that sense, you'll probably have no qualms. As is, I'm not going to lie, it left an odd last impression for me - thereby knocking things back about half a grade. Otherwise, an enjoyable entry in a fun series from Guhrke.